The United States was divided into five regions to help us better understand our country. The states were grouped into regions that share similar characteristics. However, there are some areas in each region that different from each other because our country is made up of many different landforms, a natural feature on our Earth's surface. For example, in the West we see mountains, fertile valleys, shining lakes, and islands. There are many different types of landforms. Mountains are very high landforms. Plains are large areas of flat land that are covered with grass. Deserts get very little rain. Canyons are deep valleys with steep rocky walls. Plateaus are large, flat raised areas of land. The Appalachian Mountains run from Georgia through Maine and further north into Canada. Along the coast the Northeast is more hilly and rocky. Further west, you can find better farmland. The Appalachian Mountains begin to flatten towards the east and form into the Atlantic Coastal Plain. To the west, there are plains leading into the Gulf of Mexico from Louisiana and Mississippi. You can also find the Mississippi Rivers and Red Rivers flowing through the region. Mammoth Cave system in Kentucky- the WORLD's largest! Full of all different types of landforms! Most parts of Alaska are covered with snow year round. Some parts have a very short summer. Each region of the United States has natural resources, which can be turned into raw materials that can be used to make other products. Businesses and industries that grow in each region depend on the resources that are available to them. 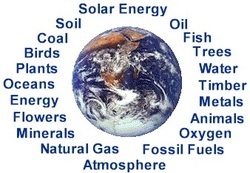 Renewable resources can be replaced and nonrenewable resources cannot. Both can be protected, renewed, and and recycled. People who provide products and services are called human resources.